Happy Halloween friends! Aly here with you today to share a cute and practical project idea to help stretch your crafting budget. This year I collected lots of adorable Halloween papers and embellishments thinking I would use all of them, of course. Well, today’s Halloween. How’s my project list coming? I think it’s safe to say I have a bit more Halloween product leftover than I had planned, LOL! Don’t put those Halloween collections away quite yet. You can still put them to good use over the next few weeks so you can get a bit more mileage out of them even if Halloween is over. Check out these Thanksgiving hostess gifts I made with my new my Hexagon Clear Cut Punch, the DIY Party Board, and some papers from the…wait for it…Pink Paisless Spellcast collection! I selected some of the less Halloween-themed papers from the collection that include fall colors, and then grabbed some of my favorite We R tools. Thanks for joining me today. Be sure to stop by each day this week for more projects from our team featuring the new Clear Cut Punches! Hello We R friends! We hope you enjoyed your weekend and that your Monday’s going well so far. We’re thrilled to share another exciting new release with you today. Introducing the Square Punch Board! With the newest member of our popular Punch Board family you can easily and continuosly punch any size square or rectangle from 3/4″ to 4″. 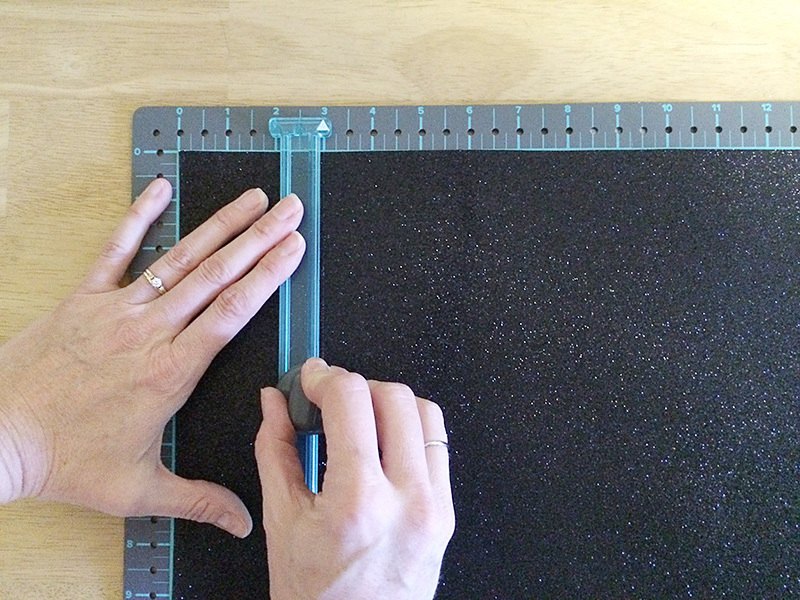 Simply adjust the guides to the desired size, and punch. The Square Punch Board is perfect for making customized planner squares, 3×4 cards, gift tags and more! This must-have board features adjustable alignment guides and includes both inch and centimeter measurements. Unlike other punches, you can utilize an entire sheet of paper without waste. The Square Punch Board starts shipping to retailers on Nov. 13, the watch for it in stores and online near the holidays! Happy Friday! We hope you’ve enjoyed the projects our team has shared featuring the Typecast typewriter this week. Today we’re finishing things off with some projects we’ve found around the internet by you–our friends and fans! We love seeing what you create with our tools and we’re excited to share some of your projects. We love this project we found on the Heidi Swapp blog by crafter Jennifer Evans! The Typecast typewriter and Heidi’s Storyline Collection are the perfect pair for preserving Jennifer’s precious heritage photos and memories. CLICK HERE for more details. While the Typecast fits perfectly for telling stories about the past, it also adds a cool modern vibe to current stories, photos, and memories. Visit the Think Pink and Mint blog HERE to check out this cool scrapbook layout featuring the Typecast typewriter and paper collection. It’s easy to add details to Traveler’s Notebooks, Photo Journals, and Mini Albums with the Typecast. Just roll your journaling spots and tags right through the typewriter and type directly on them. CLICK HERE to see more photos of this gorgeous gratitude journal by Kim Jeffress for Heidi Swapp. Taking photos of precious mementos or other sentimental items and preserving them in an easy Heidi Swapp Storyline album is a seriously genius idea! Add the memories and stories about the items with your Typecast, along with a photo, and then you can let them go and de-clutter your house, attic, or closet. Win-win!! More details HERE. Add custom sentiments or design elements to your handmade cards with the Typecast. Type directly onto a tag, label, or the card front/back and you’re good to go! CLICK HERE to check out how Carissa Wiley created these beauties with her Typecast on the Sprinkled with Glitter blog. We love how designer Lindsay Bateman recorded fall thoughts and memories in her scrapbook album with the Typecast typewriter. The typewriter font is perfect for rustic, earthy layout themes and adds the perfect touch. Visit Heidi Swapp’s blog HERE for more photos and details. Thanks so much for joining us friends! We hope you found some helpful inspiration for using the Typecast typewriter in your memory keeping, cardmaking, and other projects. Have a great weekend, and we’ll see you back here next week. Hello everybody! Soraya here to share with you a special journal made like a minibook about Halloween and the Spooky Party we threw last year with my kiddos and all their friends! This journal is above all made of photos and decorations, but there is also some journaling that I wrote with the Typecast, the fantastic typewriter by We R Memory Keepers! The journal itself is one of the Typecast notebooks you can find in the same collection, and they are amazing! They’re made of patterned papers, pockets, insert pages and white pages! I decorated the cover with thickers and diecuts from Pebbles! And for a spooky effect, I added some eyes in the O letters. The Typecast is perfect for writing journaling, adding titles and details. I love how the type is retro and authentic, it gives a very particular style to our wrtiting. To complete this insert page, I added little elements like this cute butterfly that I attached thanks to the Staple Board. Did you know that you could also use the Typecast to type on vellum? This is so fun and cool! I used a vellum with a foiled spider web design. This way, the patterned vellum is also decorating the journal! You can also write titles and details and decorate directly on the small diecuts. This is how I added “Trick or Treat” on the mini donuts. To make this string background I used the Stitch Happy black thread and randomly glued it to the white paper with my hot glue gun. Hope you had fun joining me today with this Halloween theme using the amazing Typecast! Happy creating everyone and until next time! Hello! It’s Eva Pizarro on the blog today showing you how to make your journaling the most important element of your layout using the Typecast Typewriter. I have always loved to write lots of journaling on my layouts but, like many others, I don’t really like my handwriting! With the Typecast Typewriter my journaling is beautiful and it can be an important element of design. To create my journal I placed my picture and some stickers on my cardstock, and gently drew the journaling shape I wanted with a pencil. I used my Typecast Typewriter with a black ribbon to type my journaling. I love that I can fit my 12×12 pages into the typewriter with pictures, stickers and everything! This is my journaling result. I really like the graphic look you can get with the Typecast Typewriter. I made a border with some washi tapes. We R Memory Keepers now has a new line of washi tape rolls with lovely designs and phrases! Because the main focus of my page is my journaling and my photo, I embellished with just a few stickers from the Heart of Home collection by Pebbles. I adhered some of them with 3d dots to give my page some dimension. My black and white title was the perfect match to my black journaling. Did you knew We R Memory Keepers has colored ribbon for the Typecast as well? Have you ever made the journaling an important element of your page? ! The Typecast Typewriter makes this task super easy! I created star shaped journaling on this layout too, be sure to check it out! Hello friends, and welcome to Typecast Week! Our designers have created some beautiful projects that highlight how versatile and convenient the Typecast typewriter is when adding details to cards, layouts, and other paper craft projects. First up is Laura with a festive Halloween card! Good morning We R Memory Keepers friends. It is Laura here today with a layered card idea for you using the Typecast Typewriter and the Frame Punch Board. I make a lot of handmade cards for friends. I love that I can make a cute outside for my card, but I have often struggled with how to put some type of sentiment on the inside of the card. I usually add a handwritten greeting, but sometimes I want the inside of the card to be more like the inside of a traditional store bought card. I have done this before with stamps, but I don’t always have the sentiment I want. The Typecast Typewriter makes this easy. I started by creating a four inch by six inch card base out of Pebbles Trick or Treat cardstock. Then, using the Frame Punch Board, I punched out all four corners of the paper and trimmed the inside using the frame punch board. I created three frames to go on the front of the frame. Each one was ½ inch smaller than the one before. I used the 6 x 6 inch Trick or Treat paper pad for all the papers. I attached them to the front of the card using a mix of foam adhesive squares and regular double sided adhesive. To create my sentiment on the inside I used the Typecast Typewriter. I used a sheet of gridded paper from the small 6 x 6 Trick or Treat paper pad. Then, I typed out a fun Halloween quote from Shakespeare’s Macbeth. It is the perfect saying for a Halloween card. I added an adorable cupcake cardstock ephemera using foam adhesive squares. I also trimmed out a saying from the paper pad that said “Trick or Treat” and added it to the top of the innermost frame. The sentiment for the inside I trimmed to fit and used the corner rounder from the frame punch board to round the corners like I did on the card edges and frame edges. I attached it with double sided adhesive. The layered frames are so fun on this card. They add a lot of dimension without a lot of bulk. And I am so pleased I finally have a way to create a special message or saying inside my cards that looks great! Good Monday morning, We R fans! We’ve got some exciting news to get your week off to a great start. Announcing not one…not two…but FIVE new releases in our Basic Tools line! This amazing new release works with any size marker to create an airbrush look on cards, scrapbook pages, and more. This portable, handheld, must-have tool requires no batteries, so it’s perfect for on-the-go crafting. Easily fasten your papers without staples! This handy new tool is environmentally friendly, and fastens multiple sheets of paper on corners or sides. It’s great for kid’s projects, home, and office. Make perfectly even layers, mats, and borders with the new Layer Guides! They’re ideal for photos, cards, scrapbook pages and more. The catch-lip system requires no measuring, and the edges are metal-reinforced for accurate cutting. 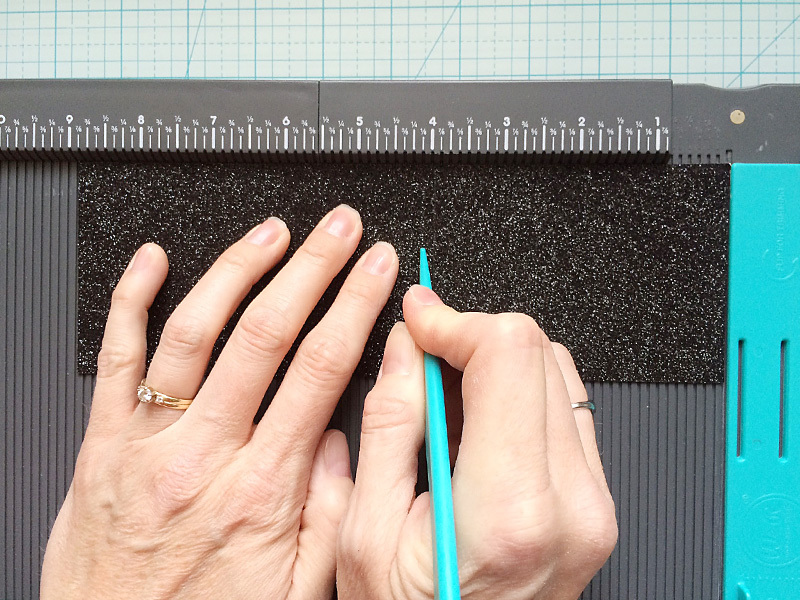 Create perfect 90° corners with the new Square Guide! It has a metal reinforced edge and a catch-lip on the bottom and side for accurate cutting. Four circles are included for tracing, cutting, or journaling. 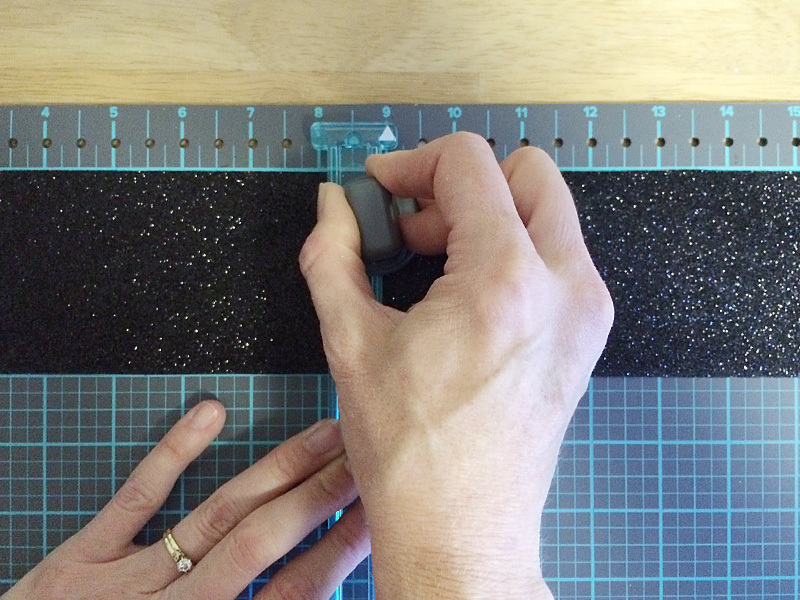 The Square Guide accurately measures in 1/8″ increments. Create six different torn edges with the new Tear Guides! The transparent material includes 1/16 inch measuring increments, plus a water pen for tearing heavy papers. Thanks for joining us today for our exciting news! These Basic Tools begin shipping next month, so watch for them in stores in December. Happy Friday friends! It’s Aly here, and I hope you’ve enjoyed this week full of spooky decor ideas. Today I’ve got a fun Halloween DIY for you featuring the Photo Lights Strand. One of the things I love about Halloween decor is playing with light and dark. It’s a unique holiday that allows you to incorporate both into your home or party decor. I couldn’t wait to create something with the Photo Light Strand for Halloween! I started by purchasing some digital images from the American Crafts Boo collection on the AC Digitals website HERE. I dragged them and dropped them onto an 8.5 x 11 canvas in Photoshop. Then I printed them onto the Backlit Film with my inkjet printer. You can also use a laser printer, but just be sure to print on the duller side of the film, not the smoother side. Then I traced and cut them out using the template included with the light strand, so they would fit into the individual frames. The light strand has ribbon loops at each end for hanging, and a battery pack that requires three AA batteries. I love that you can customize the photos/images in the light strand to match the theme of your event or party. This is such a fun addition to my Halloween decor, and it’s so easy to make. I love it! Thanks for joining me today, and have a crafty weekend! For today’s Throwback Thursday, we’re sharing one of our most popular Halloween projects from 2015. 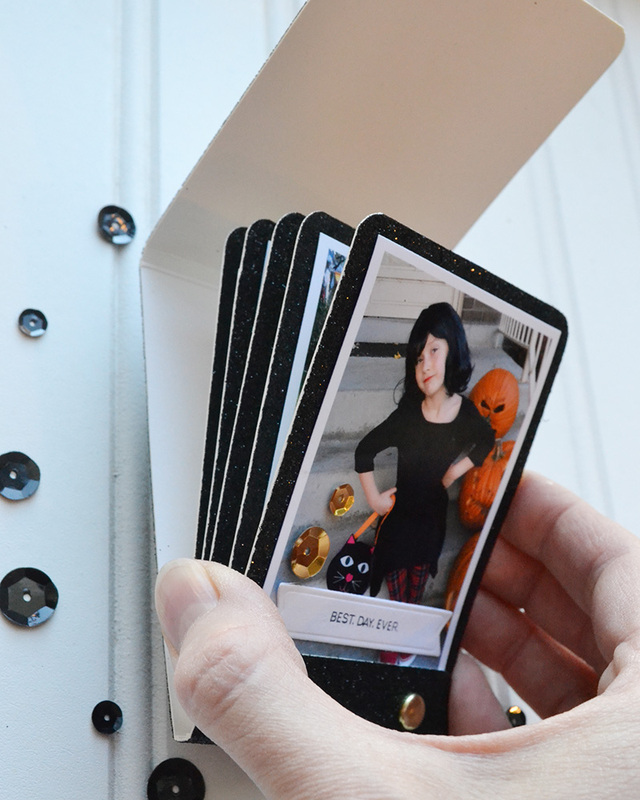 Read below to learn how to make your own Halloween Matchbook Mini Album. Hey there crafty friends! 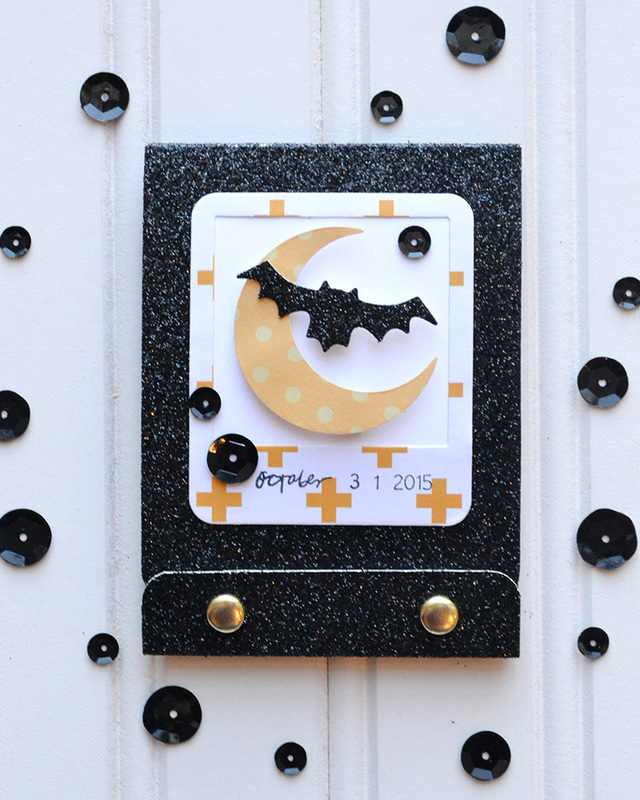 It’s Aly here again to share a fun and easy DIY Halloween Mini Album with you using some of my favorite new We R tools, along with some old stand-bys. We’ve created a tradition at our house of trying on our Halloween costumes a few days before the big day to see how they look, and so I get a chance to take some good photos in full light and under ideal circumstances. This has been such a stress reliever! Now I can enjoy the festivities on Halloween night just as much as everyone else without worrying about getting the perfect photos before it’s all over. 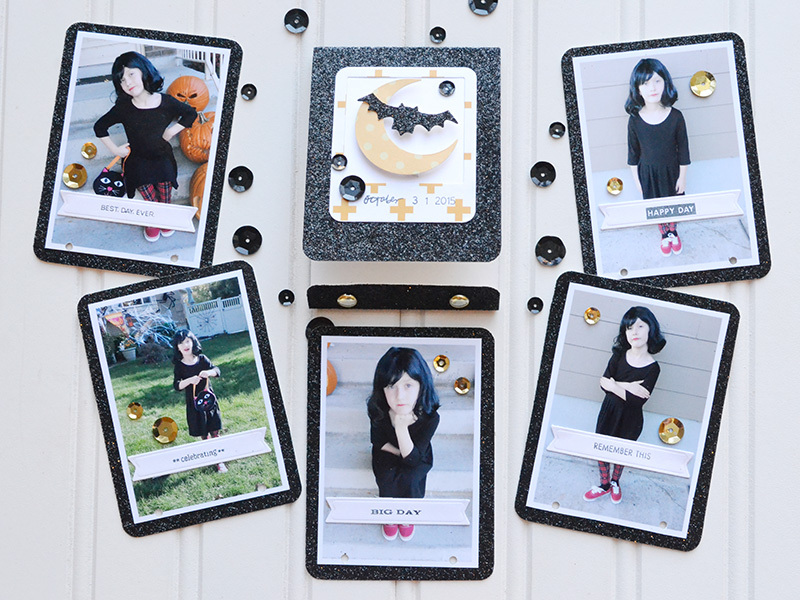 I just took some photos of my youngest daughter all dressed up as Mavis from Hotel Transylvania, and decided to make a simple matchbook mini album to display them using the Template Studio and some black glitter Designer Poster Board as my base. To create this 3×4 inch album I cut a 3″ x 9″ strip from a piece of black glitter Designer Poster Board using the Template Studio. Poster board makes a great mini album base since it’s sturdier than cardstock, but not quite as stiff as some chipboard can be. Then I used my Trim and Score Board to score lines at 3 5/8″, 3 3/4″, 7 3/4″ and 7 7/8″. You can trim a bit of extra off the left end if you’d like to leave more room to see your photos once the album’s assembled. To create the inside pages for the album, I trimmed five pieces of black glitter Designer Poster Board to 2 7/8″ x 3 7/8″ so they’re slightly smaller than the cover. Next, I rounded the corners of my cover and inside pages with my 1/4″ Corner Chomper, and then punched 1/8″ holes in the bottom of the inside pages, and in the bottom front flap of the cover with my Crop-A-Dile. I added my 2 1/2″ x 3 1/2″ photos to the inside pages using adhesive dots. They stick well to the glitter on the poster board. ( I added my photos after punching the holes, but I recommend adding them before you punch the holes so you don’t have to punch twice.) I used some Dear Lizzy roller stamps to add journaling, and then die cut the stamped phrases to create labels for each photo. Then I added a few gold Sequin Stickers to finish off my album pages. I place brads into the holes of the bottom front flap, and then into the holes of the inside pages to bind the album. Since the brads don’t go through the back of the album, the prongs are hidden, keeping the album neat and tidy. Finally, I embellished the front of the album with some shapes that I die cut with my Evolution Advanced from some of the new DIY Party Double Sided Paper Pad. I added a few black Sequin Stickers, and stamped the date as my title with a Heidi Swapp roller stamp. This little matchbook mini is easy to make and oh-so-fun! It perfect for showcasing Halloween, birthday, or holiday photos. It would make a great gift album as well. Hello and welcome Trick or Treat fans! It’s Chantalle here and I’m going to show you a super easy, spookalicious décor idea you can use for Halloween, which is right around the corner! The humble ghost is a quintessential hallmark at this time of year. These little fellows are created in just three easy steps! Make them in abundance and hang inside the home or suspend outdoors to float in the breeze. The heads of the ghosts were created using my DIY Party Globe Punch. 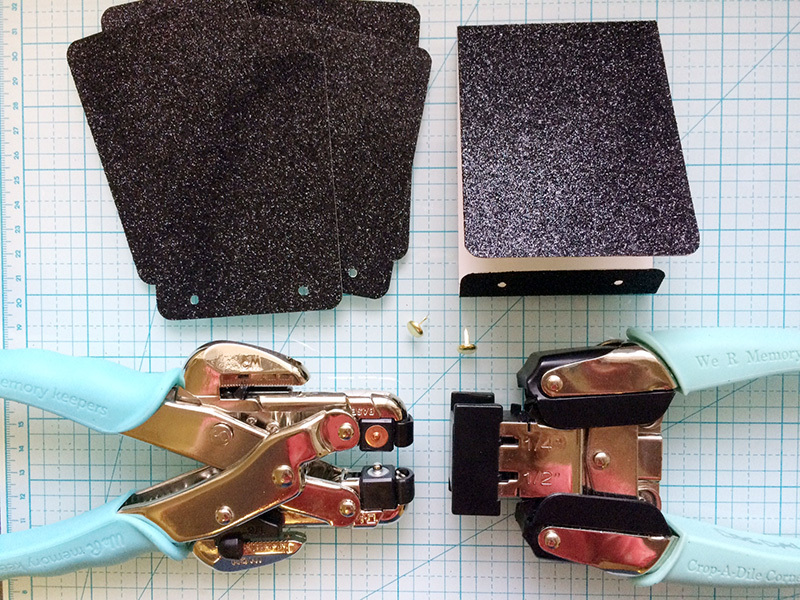 This clever tool allows you to create custom covers to adorn LED light strands! I’ve used the tool quite simply this time, tying off one end to create the globe shape and threading it through some muslin fabric. To start, I trimmed some sheets of Core’dinations Smooth Premium Cardstock down to 4 x 7.5 (l) inches. Lining the left short edge of the paper up with the alignment guide mark, I punched. One then slides the paper slightly to the left, to meet the next alignment guide. Punch again. Now one continues to punch left to right, matching the punched shape with the shape embossed into the tool. This is so you know you are aligning the next punch correctly. Continue until you have punched the length of the paper. Now, flip the paper and do the same for the opposite side. The Globe Punch (as with all WRMK tools) comes with full instructions. Loop the top little hook shapes together to close the globe at both sides. I strung some twine around one closed side and used a marker to draw some faces on to the cardstock. Finally, I threaded the twine through some muslin, which I cut into a very rough square shape. You can, of course, make the squares as large as you’d like to make the ghosts really floaty! They look cute huddled together and would even make a great mobile! Thanks so much for joining me today. Happy Haunting!